New York Times: Loreto, Mexico, 8th place to go in 2011! The New York Times posted a list of “The 41 places to go in 2011” (http://www.nytimes.com/…) and it listed Loreto, Mexico, as number 8! 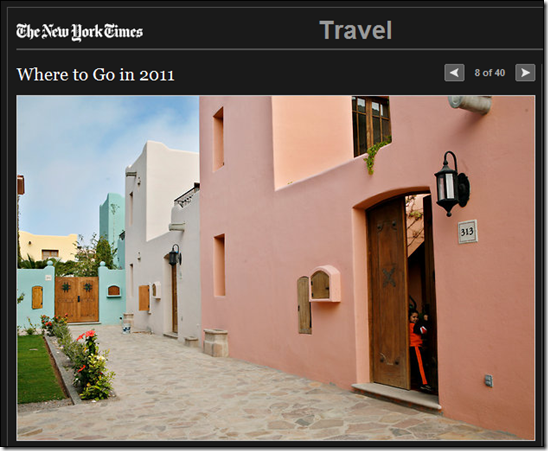 The New York Times slideshow of the “The 41 places to go in 2011” – Loreto is 8th! Very cool – I have to agree. See below for a screenshot of the description the New York Times gives of Loreto – it’s right on! 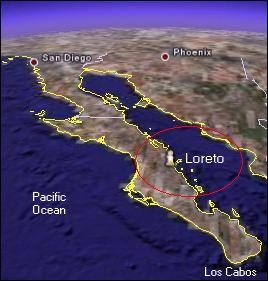 Continue reading "New York Times: Loreto, Mexico, 8th place to go in 2011!" Janelle and first stumbled to what is today Loreto Bay in 2002, when we drove from San Francisco all the way down to Cabos San Lucas and Todos Santos at the southern tip of Baja California Sur (BCS). At the time we literally stumbled upon the “Camino Real” hotel (what is today the “Inn at Loreto Bay”) – we were asking for directions to a hotel or restaurant and the parking attendant at the “Camino Real” told us “we’re a hotel/restaurant – we just opened!”. Not only is the "Founder’s Neighborhood” done, but a large part of Loreto Bay’s second neighborhood, “Agua Viva” is also pretty well built. Try it out for yourself - to download Google Earth, point your browser to http://earth.google.com – it’s free. 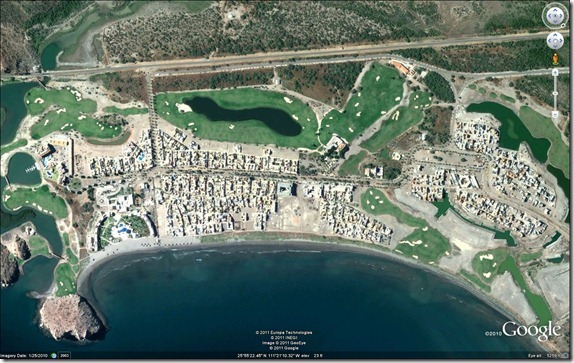 To enable in Google Earth 6.0 and above click on View > Historical Imagery – if historical satellite images are available you’ll see a slider in the top left to control the year/image. A couple of days ago I released the Loreto Bay Agua Viva Layer for Google Earth (click here to access it). 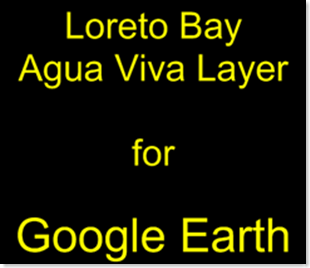 In this screencast I explain how you can easily download and install Google Earth and then check out the Loreto Bay Agua Viva Layer. 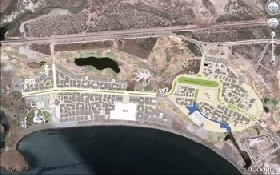 I heard that Loreto Bay has some kind of map application in its web site. Since that application is only available to LB owners, I decided to create this Agua Viva Layer for Google Earth. I don't know how good the Loreto Bay map is or how it compares to Google Earth - but our Agua Viva layer is free and available to anyone. See the tutorial below for more details. Continue reading "Screencast: Loreto Bay Agua Viva Layer in Google Earth"
If you don't already have it, download and install the free application "Google Earth" from http://earth.google.com/. 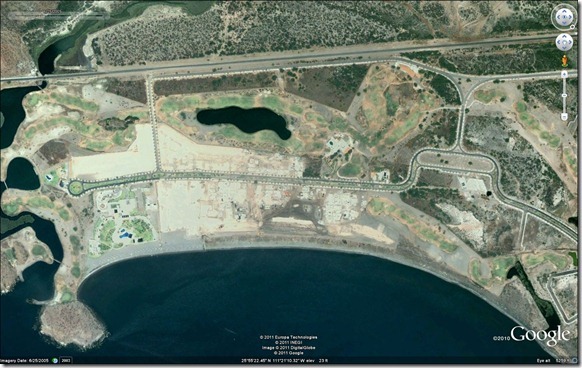 Then click on the image above to open the Loreto Bay Layer for Google Earth. If you are new to Google Earth, check out this tutorial. 6/28/2008: Added the Founders' Neighborhood layer, 20080628-Loreto-Bay-in-3D.kmz, 3.6 MB. Added the Founders' Neighborhood layer on a suggestion from Drew McNabb (FN 49) - thanks Drew! Now we have maps for both the Founders' Neighborhood and half of Agua Viva. 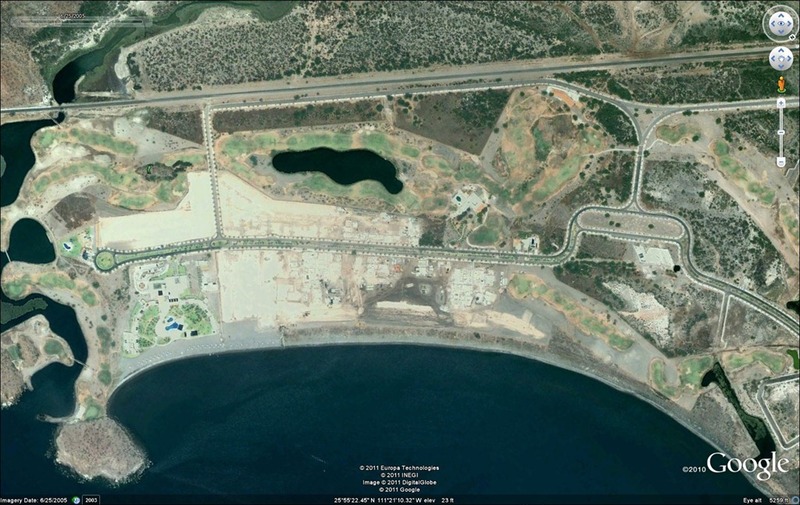 Renamed this article the "Loreto Bay Layer in Google Earth". 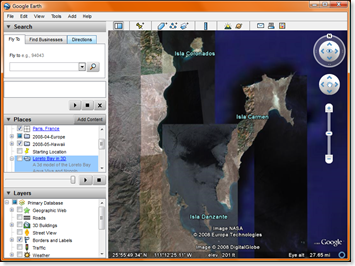 6/24/2008: Released a tutorial that explains some of the features of Google Earth and the Agua Viva layer. Check it out here. Agua Viva Layer for Google Earth. 3D Model of Casa Brasil (the house we hope to build, located on our lot in Nopolo). AV 61 - with a picture of the owners, Barry and Patricia. The site is fairly simple, it looks like a basic HTML web site you may have seen back in 1998. But the content is pretty good: it has an updated list of restaurants, information on Hotels and places to visit, activities and more. Note to the gotoloreto.com designer: don't use images to display content such as addresses and phone numbers. Instead just use HTML and cascading style sheets (CSS), the information will look just as good, but visitors to the site will be able to copy and paste the data. Nuwire Investor (www.nuwireinvestor.com) has published a couple of good articles on Loreto. The first one, named "Top 5 Mexican Real Estate Markets", lists Loreto as the number one Mexican real estate market for investors. Loreto is listed as "numero uno" in Nuwire Investor's article on the "Top 5 Mexican Real Estate Markets". 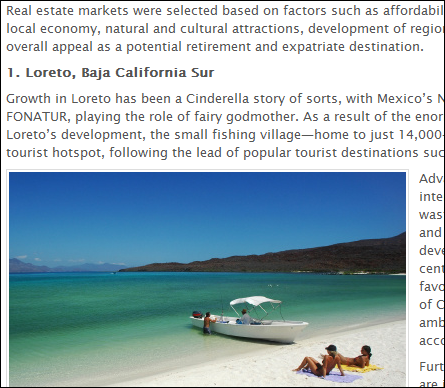 A second article, named "Loreto: Mexico's Next Real Estate Hot Spot", makes a lot of good points on why it makes sense to invest in Loreto, including its strategic location, infrastructure, Loreto Bay's sustainable approach and its history and culture appeal. I copy the full article below. Continue reading "Loreto: Mexico's Next Real Estate Hot Spot"
I received a couple of emails from folks asking why we haven't updated http://loreto.ehuna.org in the last couple of months. We're still working on our "Fidecomiso", the legal paperwork that will allow us to properly own the lot we purchased. We've purchased the lot over two and half years ago, but there were complications. We've decided we would not build the house until the paperwork is completely done. Loreto Bay owners: you should appreciate the work LBC is doing for you - you don't have to deal with the Mexican bureaucracy and unsavory characters. Continue reading "Article on Loreto appears on "Canoe Travel" web site"
VILLAHERMOSA, Mexico (AP) — Hundreds of thousands of Mexicans fled a flooded region of the Gulf coast Friday, jumping from rooftops into rescue helicopters, scrambling into boats or swimming out through murky brown water. President Felipe Calderon, flying overhead, called it one of Mexico's worst recent natural disasters. A week of heavy rains caused rivers to overflow, drowning at least 70 percent of the oil-rich state of Tabasco. Much of the state capital, Villahermosa, looked like New Orleans after Hurricane Katrina, with water reaching to rooftops and desperate people awaiting rescue. At least one death was reported and nearly all services, including drinking water and public transportation, were shut down. The flood affected an estimated 900,000 people — their homes flooded, damaged or cut off by high water. A few days ago, I wrote an article on how to open a bank account at the Bancomer branch in Loreto (click here for the details). I received an email today from Bancomer indicating that if you have a Bancomer account, you can easily donate online: just send your donation to Bancomer account #0427692633 (see screenshot below). If you don't have a Bancomer account but would like to help, you can wire the money to the above account (contact your bank for details) or just walk in at the Bancomer branch in Loreto (print this article and show them the information in Spanish below). This article is not directly linked to Loreto, but since this tragedy is occurring in Mexico I thought I'd mention it. See below for the full article. 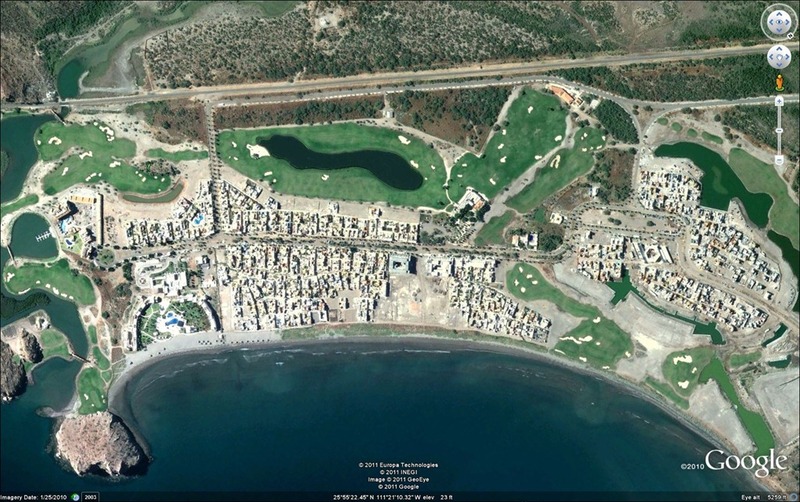 Continue reading "900,000 Affected by Floods in Mexican state of "Tabasco"; donations welcomed"
This is a 360 degrees one minute video of the Inn at Loreto Bay, a five star resort in Loreto, Baja California Sur, Mexico. You can see the Sea of Cortez, some rooms, landscape, and the hotel's tower. This video was filmed last month, in September 2007. Official web site: http://www.innatloretobay.com/ (you can book a room online). Satellite picture, right above the hotel. The video was shot in the middle of the resort, a bit to the right of the swimming pool. 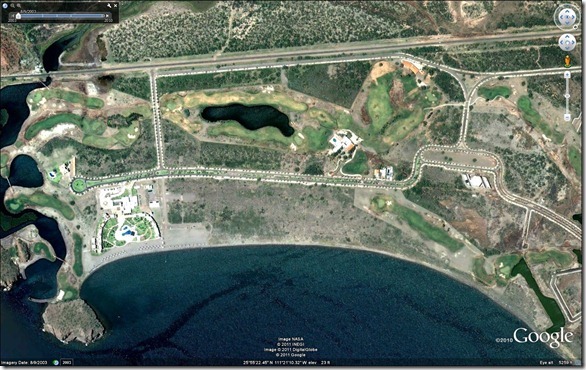 Click here to fly to the resort in Google Earth; or if you don't have Google Earth, click here to download and install it. The background music is a song called "Find the Cost of Freedom", by the great band Styx. 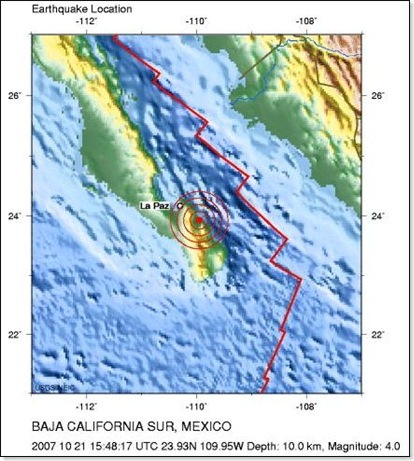 The United States Geological Survey site (USGS, http://earthquake.usgs.gov/) reports that on Sunday 10/21/2007, a magnitude 4.0 earthquake hit Baja California Sur, 44 km (28 miles) south of La Paz. Click here for more information on this earthquake. Click here for maps of this earthquake. Click here to view the earthquake location in Google Maps, where you can zoom in and out, pan, and see how far is Loreto. The exact location of the earthquake was at +23° 55' 44.40", -109° 57' 3.60" (23.929°N, 109.951°W). I haven't heard any reports of injuries or damage to property from our friends in Loreto and Todos Santos - everything seems ok. When Janelle and I started working on the architectural designs for our house, we worried about Mexican construction standards, at least in relation to California earthquake construction standards. But as we learned more about the process, we now feel that a 6 foot deep foundation and the rebar and concrete structures seem to handle such earth shaking events pretty well. I don't know what would happen if a major 6.0 or higher earthquake hit Baja, but I've heard of a few 4.0 and lower earthquakes that have occurred in the past, and as far as I know, so far Baja buildings and houses have had no problems. To access archived pages use the categories below. For more information on the categories, click here. If you'd like to receive an email when this site is updated, enter your email address below and click on "Subscribe me!". This is SPAM free, so don't worry; and you can always un-subscribe later if you get tired of information on Loreto or our project. Click here for the RSS Feed. If you are not using RSS feeds yet, you are missing out. Use the free Google Reader, it's great!